Queen of Cups Tarot Card Meaning - All Explained HERE! 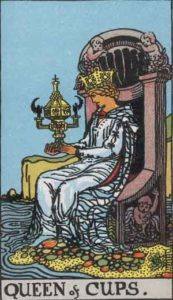 The Queen of Cups is the thirteenth card in the Cups suit. Thirteen isn’t really an unlucky number when it comes to The Queen of Cups, like most other cards in the Cups suit, The Queen of Cups is a positive one. It also has many possible interpretations, from the straight obvious meaning of a female influence in your life, to interpretations of maturity and intuition. The Queen of Cups can represent a powerful woman influential in your life, but also maturity, calmness, and sensitivity. Past – The Queen of Cups in the past position can mean of remind you of an influential female in your life. Usually for the better, this people has helped you on your way. It could have been a good teacher or other parental figure, but this person has instilled some good values. It can also represent you in the past; particularly an event where you had to be passionate, patient and understanding. Art, or some other creative pursuit, might have been big in your life in the past. maybe look to rekindle that passion now? Present – The Queen of Cups in the present position can mean that you’re currently going through a period in your life that requires you to be more patient and mature than normal. You may have just been put in charge of children, or people less mature than you who you need to keep your eye on. It shouldn’t be too much to worry about. Try to put your own good values in the people you meet and inspire them. Actively look to help others around you, they may be too shy to ask you. Future – The Queen of Cups in the future position can mean that in the near future, you’re going to go through a period where you’re going to have to be much more mature than you usually are. It could be in a caring situation, but the point to stress is that you’ll have to be patient and understanding. It might be tough on you. You’ll have to put on a brave face when things take a down turn. In effect, you will be the rock for other people. Emotions might be flying high, so be prepared to listen to others and help them deal with their problems instead of working on yourself. Work / Education – The Queen of Cups in regards to work or education can mean that you need to look for a female in a position of power for help, especially if things are going wrong. It could be that your boss, project leader or teacher just needs to see you putting some effort in. Are you in the correct field? It might be a good earner, but make sure you feel fulfilled too. Romance – The Queen of Cups in romance is a good sign regardless of your current relationship status. If you’re looking for a female partner, consider someone older. If you have your eyes on someone younger, they may be much more mature and intelligent than you previously thought. Don’t rush into things, try to know the true person beforehand. Friends – The Queen of Cups in regards to friendship can mean you need an older, possibly female perspective in your life, maybe even someone very old. It could be time to reconnect with your family if you feel like you’re missing out there. Old people generally have lots of experience that you can learn from and solid values, so don’t say no if someone old asks you to spend some time with them. The Queen of Cups can also mean that others may look to you for experience and advice, especially if you are mature enough to give it. Look out for opportunities for both; we are always learning, giving, taking and growing in life. Money – The Queen of Cups, like most of the Cups suit, is a good sign in finance, so expect financial gain soon. Be grown up about things. Do you really need to buy that? Is it something, that in a few years, you’ll think about? If it isn’t, if you’re just buying it because it’s trendy and in the moment, it probably isn’t worth it. You can put your money to much better use than spending it on things you don’t need. Health – The Queen of Cups is a good sign in regards to health. It can mean that you’ll need the mental strength to deal with something soon; particularly caring for somebody else. As has been said, be patient and understanding. You might be in their situation soon. Physically, expect improvement. Looking into good diets and traditional family recipes will be good for you right now! Spirituality and Mentality – The Queen of Cups in spirituality can mean you’re about to understand the world in a whole new way, through the eyes of someone who has ‘seen it all’. You’ll find it much easier to make analogies in everyday life, and understand things through expressions of things you already know. In reverse, the Queen of Cups can represent a level of damaging emotion, on your part. Are you letting yourself feel things as they come? Be sure you aren’t locking up your emotions and tucking them away. In very extreme cases, you may be dealing with a stressful situation in a very bad way. For example, a breakup, a death in the family, or the loss of some aspect or potential in your life. There are many things we cannot control in our lives, and to an extent, we are along for the ride. Learn to worry as little as you can. When it comes to other people, there are only a few things you can really change. We’ve selected live tarot readers to give you a FREE 3 Minute interpretation of The Queen of Cups! Scroll through them below and pick your favorite one.